One of the ways that you can help fight your diabetes is by sticking to an 1800 Calorie Diabetic Diet Plan. This number may sound scary or restrictive at first, but know that this Calorie count is higher than an active 30 year old male in good shape needs to maintain his body. The main idea behind the 1800 calorie diabetic diet plan is that you need to get 1800 calories each day, which should be manageable by most Americans. The reason why this ‘should’ be manageable is that 1800 is near to the standard diet plan for healthy living. This diabetic diet plan helps you to maintain normal blood sugar levels, and is designed so that you can lose some weight as well which is always a good thing! While on this diet it is also important that you try to keep active so that you can burn up any excess calories. Indoor and outdoor activities are highly encouraged, so lace up those shoes and get out for a bike ride, jog, walk, or other physical activity. When you are following this plan it’s very important to avoid carbohydrate foods that have a high Glycemic Index (GI). Instead, replace those bad foods with fruit and vegetables. It sounds bad at first, but once you rediscover how sweet and tasty an apple is, or how refreshing a raw, sweet pepper can be, it won’t take you too long to curb most of your sweet carb cravings. The first thing that you’ll likely ask yourself once you start to consider the 1800 Calorie Diet Plan is if you’ll actually have the will-power to stick with it. It sounds great on paper, but reality is where we need to live, and it’s here that we also face the toughest challenges. Learn the simple rules that you need to follow to live within the Calorie budget of the diet eg: how much protein, vegetables, etc make up each meal. Once you know this you can start to improvise easily. Learn how to cook food that you like to eat. If you don’t enjoy eating it, it’s highly unlikely that you’ll stick with this diet for any length of time. Learn how you can cook in batches to save time. This was a big one for myself, because I look at time in the kitchen as ‘wasted time.’ To get over this lie that I tell myself (because time in the kitchen is never really wasted) what I did was cooked larger portions of food, so that I would have several meals that I could put into the fridge, reheat, and eat them quickly.This was also important because on those days when I was feeling lazy and didn’t want to cook, the meals were already prepared in the fridge waiting for me! A good diabetic breakfast idea is to have a large banana with a cup of skim milk, along with one and a half cup of bran cereal and a tablespoon of cream cheese. For lunch, simply have an ounce of low fat Colby cheese, ½ cup of mild salsa, 2 ounces of baked nacho chips, 2 ounces of ground turkey, along with 2 cups of chopped lettuce. Dinner may consist of two thirds of a cup of brown rice with salmon, a teaspoon of olive oil, ½ cup of cooked carrots, 1 cup of skim milk and three quarters of a cup of pineapple for dessert. So don’t be afraid to get creative when designing your 1800 Calorie Diabetic Diet Plan so that you can enjoy keeping your body healthy and fit and your blood sugar levels down! Are Diabetic Food Choices Limited? Have you ever thought that being a diabetic means that yout don’t get to eat good food? Of course, that’s just self-pity talking, because the truth about diabetic food choices is that we can eat pretty much the same as anyone else – we just need to keep everything in check and make sure that we are exercising and using moderation when it comes to food. Good food for diabetes comes in a wide variety such as cookies, crackers, snacks, fudge and many other foods as well. Eating high fiber foods is highly recommended to manage diabetes. Good sources of soluble fiber such as oats, soy beans, peas, wheat and other whole grains have the added benefit of lowering LDL, or bad, cholesterol levels. Some foods that are high in fiber can also do double duty as a good source of protein. Legumes like beans, peas and sprouts can be both a great source of fiber and protein. You can also snack on nuts such as peanuts, sunflower kernels, almonds and pistachios for good sources of healthy protein. Try to stick to the unsalted versions of these nuts however, so that you don’t ingest the extra sodium. Where Does Diary Fit into the Diabetic Meal Options? Low-fat or skim milk and cheese are also healthy ways to obtain protein and calcium. Non-starchy vegetables like celery, lettuce and spinach should make up 80 percent your daily servings of produce. Eating fruits and vegetables that vary in color daily will also provide different vitamin and mineral benefits. All of these are food choices for diabetics because they are low in both carbohydrates and sugar. We all know that we need to manage our intake of these two key items, but the often overlooked side effect, is that by doing this we’re also promoting a very healthy lifestyle that will leave us feeling and looking great as we drop weight. The Diabetic food choices that you have are many, and food is always going to be one of the most important factors in your diabetes management, but at the end of the day you need to remind yourself that you are in control of your life and you get to make the decisions and live with the consequences of those decisions (both good and bad) so enjoy it! Life is great. It is challenging to make a lifestyle change that will improve your health. Studies show that by simply making a habit of eating at home, persons with diabetes have a better chance of effectively controlling or improving their health. No longer do those with diabetes have to eat separate, tasteless dinners. Healthy dinners are fast and easy to prepare and as long as you are able to properly manage your dinners then you can properly and safely maintain control of your diabetes. There are many different companies out there who will help you get all of those food for diabetics in order to help you properly maintain not only your health but also your diabetes. With these companies they can provide you with diabetic menus that are easy to follow and as well as can help make these type of food for you and ship them directly to your home or office. Many companies love to help make your life easier by preparing your diabetic dinners for you so that all you have to do is come in from a long, hard day at work, school or wherever else and pop your dinner right into the oven, microwave or toaster oven and wait for it to cook. Dinners for diabetics that are already prepackaged and premade are a great gift to give to a diabetic that you know or maybe a person that has a busy lifestyle or leads an elderly lifestyle and does not have the resources to always be able to prepare a diabetic dinner for themselves. With these dinners already made up, it saves you time and money and most importantly keeps you healthy and helps control your blood sugar! Here is a great place to purchase your pre-packaged diabetic dinners. You will find a large variety of meal plans available that will assist in diabetic needs and sodium reduced diet requirements also. Meal plans are generally based around a 2,000 calorie per day diet. Just remember, the best way to managing your diabetes, is by closely monitoring the food you eat! There are many different types of best blood glucose monitors on the market and it is up to you to determine which one is best for you and your needs. Blood glucose monitors are the key to being able to safely maintain and monitor your diabetes and blood glucose levels safely and effectively. With all the many different types of blood glucose monitoring devices on the market often times a diabetic can feel overwhelmed and unaware of all the different types of diabetic monitoring devices to know which ones are the best ones to get or purchase for their needs. For example, not only are their best blood glucose monitors but there are also diabetes watches which are usually worn on the wrist like a wristwatch. The monitor checks blood glucose levels by administering a painless electric shock which draws interstitial fluid from the pores and this is read by the monitor to obtain a blood glucose level. This testing can be done with no pain or other side effects as often as every 20 minutes and the readings are recorded by the monitor, which can also be set to alarm if readings are too high or too low. With this kind of continuous sampling tracking and trending changes in blood glucose levels throughout the day is relatively easy with diabetic watches. Diabetic watches, blood glucose monitors and many other diabetic supplies which can be found on the market today are a vital part to being able to safely and accurately monitor your blood glucose numbers and readings. Why not safely monitor you diabetes with all of the proper best blood glucose monitors that is now offered on the market so that you can safely and accurately test and keep a watch on your diabetes? Who wants to be a diabetic and not get to enjoy yummy candy? Often times we plague diabetics as not getting to eat good food but often times that notion is all wrong. Diabetics can eat the same foods that we eat just in moderation and by often times substituting sugar with sugar substitutes. 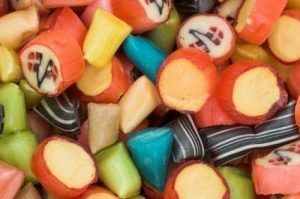 There are many various diabetic candy recipes, diabetic snack recipes and other recipes so that diabetics can have all of the same yummy treats that we do! My grandmother was a diabetic for years before she passed away and the worst part for me was preparing snacks and candy for my kids but knowing that I couldn’t share them with her or if they took their treats up to her house she could get into them so I started researching diabetic candy recipes so that I could make yummy treats for not only my kids but also my grandmother to enjoy! Combine pretzels, marshmallows, and cashews or peanuts in a large mixing bowl; set aside. Combine sugar, half-and-half or light cream, and butter or margarine in a heavy saucepan. Bring to boiling over medium heat, stirring constantly. Remove from heat. Add butterscotch pieces. Let stand 1 minute to soften pieces. Stir until combined. Let stand 5 minutes. Pour butterscotch mixture over pretzel mixture; stir to coat. Drop by rounded teaspoons onto baking sheets lined with waxed paper. Chill until firm. Store in a tightly covered container in the refrigerator. Makes about 30 pieces. Make-Ahead Tip: Prepare candy and store in a tightly covered container in the refrigerator up to 1 week.